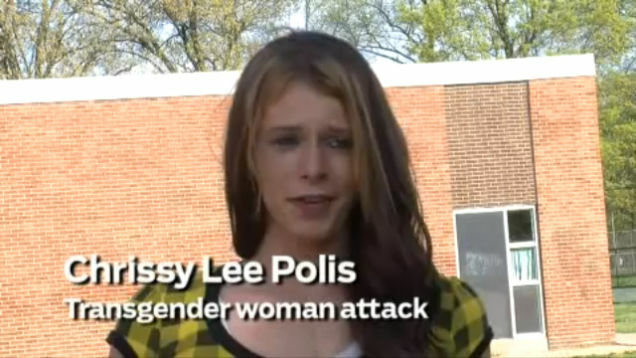 Chrissy Lee Polis, the 22-year-old transgender woman who was the subject of a video-recorded beating in a Baltimore-area McDonald's last week, spoke out for the first time in an interview with The Baltimore Sun. She said seeing herself all over the Internet and all over the news has been "like walking out of the closet all over again." Polis is concerned that the public attention could trigger more violence - and worries it could hurt her chances of getting a job. "I want to cry, but I need to hold my head up," she said. Though hate crime charges against Polis' attackers—said by police to be two women ages 14 and 18—haven't yet been filed, the state's attorney says that a review will take place next week to determine "if [they] need to make additional charges." The McDonald's employee who recorded the video has been fired, and the franchise owner says he may take further action against other employees.